New! 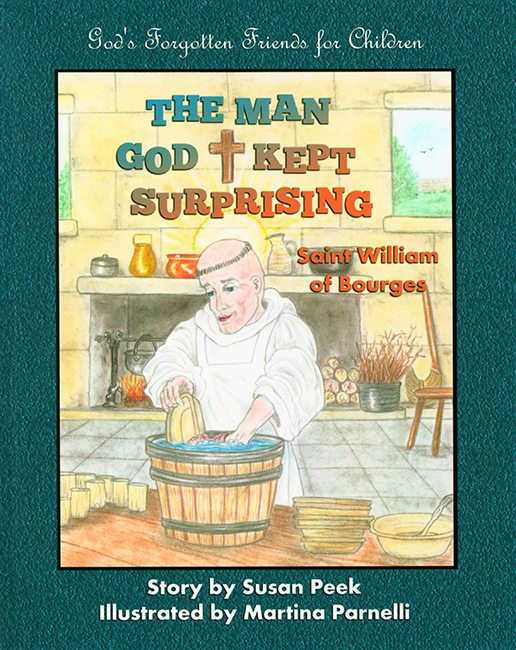 The Man God Kept Surprising - Meet Saint William of Bourges, a young French nobleman who could have had it all . . . and gave it all up! Riches, fame, knighthood, an easy life in a grand castle. These were the things that rightly belonged to William by his noble birth. Instead he chose to leave it all behind and give himself completely to God. Building a hut in the quiet woods, he planned to live out his days there in prayer and solitude. But God had other plans for William . . . plans that ensured his suitcase would never stay unpacked! Join William as God sends him one surprise after another, until William finally receives the biggest surprise of all! With charming full-color illustrations and easy-to-read text, this second book in Susan Peek's new series for children is sure to capture the hearts of Catholic children everywhere. 8 x 10 inches. Soft Cover. 40 pages.